The Banana Spider (or Golden Silk Orb-Weaver) is the common name for a number of species of beautifully colored silk spider that were assigned the taxonomic genus name Nephila. They have legs that are long and hairy and the female is much bigger than the male. They can form webs that can get as big as three feet wide. They are also known to surround several hundred eggs in an egg sac of 2.5 to 3 cm in diameter is a basket of curly yellow silk. It is from this behavior that they get their name Golden Silk Orb-Weaver. They eat flying bugs, including flies, bees, wasps, small moths, and butterflies. 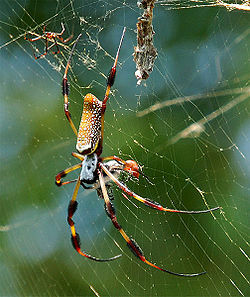 They are called Banana Spiders because of their yellow bodies, but their technical name is the Golden Silk Orb-Weaver. Their webs are very strong and can withstand a lot of pressure. They look like gold in the sunshine; that’s why they are called Golden Silk Orb-Weavers. Their legs are long and hairy and the female is much bigger than the male. The male is about a half inch long, but the female can get up to three inches. The webs they form are built up to three feet wide. They usually live in the US, especially Florida. They rarely bite people, because some people have allergic reactions to spider bites; at least it won't kill you. 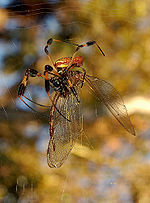 Golden Silk Orb-Weavers go through several molting processes. When a male Golden Silk Orb-Weavers reaches maturity, they accompany the females on their webs. About five cm above the female sits the male, who is protecting her. The Golden Silk Orb-Weaver, like most spiders, do not chew their food. Once their prey is caught in their web, they inject venom. The venom either paralyzes or kills the prey then turns its insides into liquid. While the female spider waits for the venom to do its job, she wraps up the bug in silk so that she can drink the liquid, or tie the wrapped up bug to her web for snacking on later. Golden Silk Spider Dale Joyner, 1990-1996. Reproduction of Nephila clavipes Stephanie Morse, Animal Diversity, 1985. Golden silk spider - Nephila clavipes Featured Creatures by Robinson and Robinson 1974. This page was last modified on 22 March 2009, at 22:54.